Lake Timiskaming or Lake Temiskaming (French: Lac Témiscamingue) is a large freshwater lake on the provincial boundary between Ontario and Quebec, Canada. The lake, which forms part of the Ottawa River, is 110 kilometres (68 mi) in length and covers an area of almost 295 km2 (114 sq mi). Its water level ranges between 175 m (574 ft) and 179 m (587 ft) above sea-level, with a mean annual average of 178.4 m (585 ft). The lake is in places up to 216 m (709 ft) deep. There are several islands on the lake, notably Mann and du Collège Islands. There are 30 species of fish in Lake Timiskaming, the best known are northern pike, sturgeon, lake trout, walleye, smallmouth bass, bullhead, carp, burbot, perch and whitefish. The lake was shaped during the last ice age when glaciers carved into the rock. It is also the remnants of a huge basin called Lake Ojibway, which existed about 9,500 years ago. Between 1976 and 1981 the DuPagne Classic fishing tourney took place at Wells Rock (David's tobogganing hill). 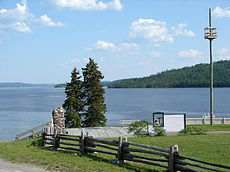 For the trading post and some history see Fort Témiscamingue. Looking south over Lake Timiskaming from Fort Témiscamingue near Ville-Marie, Quebec. Lake Timiskaming is located within an ancient major rift valley that extends several hundred miles to the north-east called the Timiskaming Graben. It is the northern extension of the Ottawa-Bonnechere Graben, which is part of the Saint Lawrence rift system. There have been recent earthquakes along the rift valley, the most recent being in 2000. There are numerous faults in the area and has produced cliffs such as Devil's Rock, just 5 km (3 mi) south of Haileybury and is dated to be 2.2 billion years old. There are known kimberlite pipes within the rift valley that are considered to be diamondiferous. ^ Sader, Jamil Andrei (2004-01-01). "Low temperature serpentinization processes and kimberlite groundwater signatures in the Kirkland Lake and Lake Timiskiming kimberlite fields Ontario, Canada". United States -- Texas: The University of Texas at Dallas. This page was last edited on 4 April 2019, at 18:01 (UTC).